Upgrading your home is one of the best investments you can make – improving curb appeal, boosting resale value, and even lowering monthly utility bills in the process. Like every other investment, however, it will require a means of financing. At Green Air, we believe every homeowner should be able to enhance their homes and quality of living when necessary, without the potential delays of low finances. That is why we work with renowned home improvement financing companies, HERO® and YgreneTM to provide our clients with 100% financing for energy-efficient upgrades. 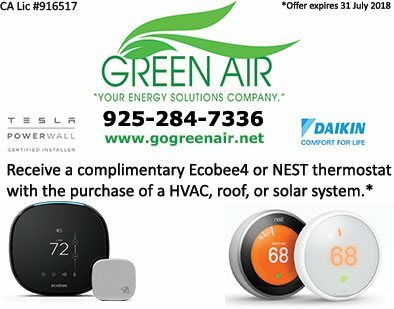 As your trusted energy solutions company, Green Air will work with you to select the best option. We will also help you in handling the application process along with all other necessary documentation to get you started. From solar and smart HVAC systems, to roof replacements and new constructions, we’ve got you covered. Whether you want to reduce your carbon footprint or slash your utility bills, let Green Air help make it happen today at affordable rates. Call us at (925) 62-SOLAR or (925) 28-GREEN or fill out our contact form to get started. We would love to hear from you.